On Tuesday, which turned out to be the hottest June day in twelve years (33.5 °C), I invited my mom to a grand tour of shaved ice, or bingsu. My plan was this: eat icy desserts all day without eating an actual meal. I figured a day that felt like you were in a steaming rice cooker would be a perfect day to do this. My mom agreed. 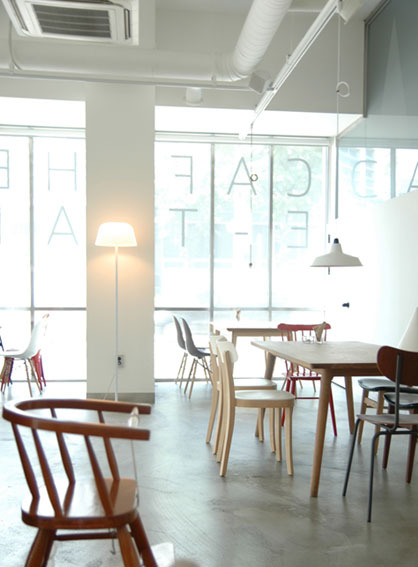 Our first stop, Café the Air, is one of those stylish places with a lot of white space and simplistic designer furniture. 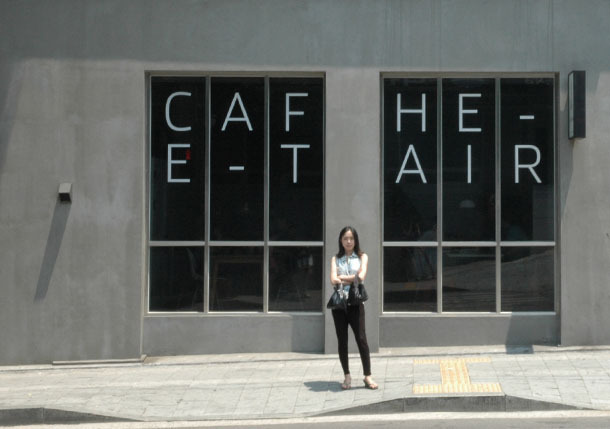 They also serve food, but we were only there for the famous “towering” green tea bingsu. It looked really impressive with tall homemade green tea ice cream top and gigantic icy middle drenched in thick green tea sauce. The cashew nuts and almonds were a nice touch. But eating it was a challenge. It almost felt like we were playing Jenga; we dug carefully with our spoons, concentrating hard not to knock down our ice tower. The taste? Overall, the ice was soft and fluffy and the green tea flavor sufficiently strong. Sweet red beans nicely mellowed out the bitter green tea taste. When the ice started to melt, what remained in the bowl was similar in texture and taste to green tea Frappuccino, only (hopefully) less fattening than that. If you’re a big fan of green tea like myself, you’d want to try this. Then we headed to one of my absolute favorite places in the city. 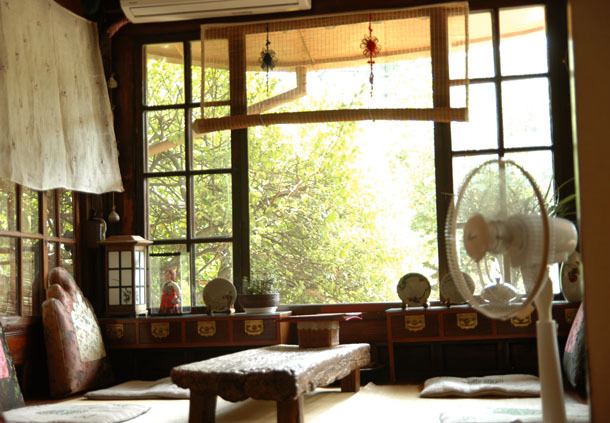 Suyeonsanbang means “a small cottage in the woods where writers gather.” The house belonged to Lee Tae-jun, a novelist, from 1933 to 1946. He defected to North Korea after Korea won independence from Japan and now his house is preserved and turned into a traditional teahouse. The waitress approved of my choice of pumpkin bingsu, which is only served during summer. She didn’t forget to mention that they don’t use artificial colorings or preservatives. Surprisingly the ice was not as soft as other popular bingsu these days. It was the coarse old style bingsu I remember from my childhood. Bigger particles of ice don’t melt in your mouth immediately, but because of that it’s more refreshing and chilling. It didn’t feel like I was eating dessert since it felt so healthy to be eating minimally sweetened steamed pumpkin and red beans. The toppings were pumpkin ice cream, dried persimmon, and black rice cake. On the menu it said their bingsu was “sufficient for one meal” and that was true. With a nice breeze coming in from the open doors and soothing traditional Korean music playing in the background, having a mouthful of excellent pumpkin bingsu was blissful. 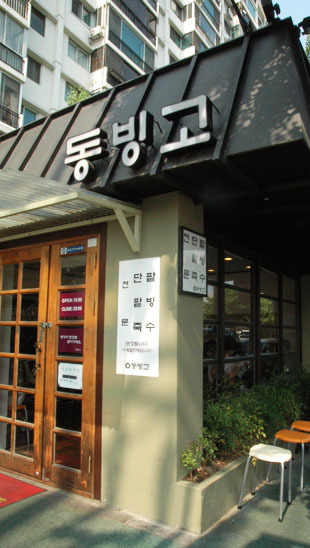 Dongbinggo is considered as one of two famous bingsu places in Seoul. I’ve been to the other one, Mealtop, in Apgujeong-dong Hyundai Department Store multiple times, but never been to Dongbinggo. It was time to give it a try. 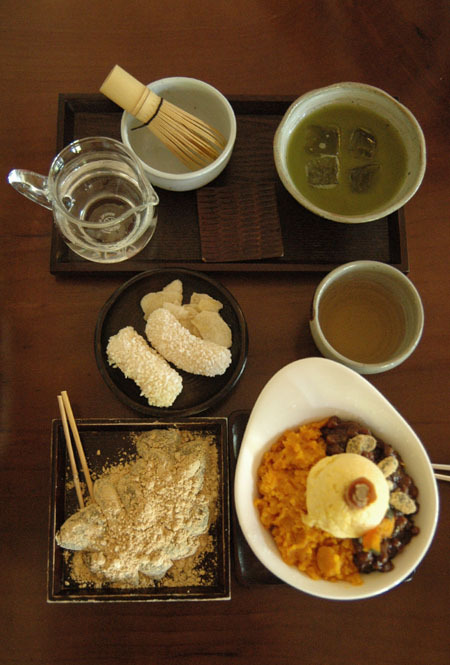 Dongbinggo has five different types of bingsu: original red bean, red bean with grain powder, green tea, coffee, and royal milk tea. We ordered the original and royal milk tea. I was skeptical about the royal milk tea bingsu because it looked “too complicated” for my taste. But I was pleasantly surprised by its combination of delightful flavors—bananas, roasted coconut bits, walnuts, vanilla ice cream, drizzle of chocolate syrup, and milk tea. The crunch and fragrance from the roasted coconut bits really made this bingsu stand out. Walnuts were raw, with skin, which gave them the bitter flavor, but it balanced out the sweetness of vanilla ice cream and chocolate syrup. Their original one with red beans and rice cakes was perhaps the least sweet patbingsu I’ve ever had. I could actually taste the earthy nuttiness of Korean red beans. 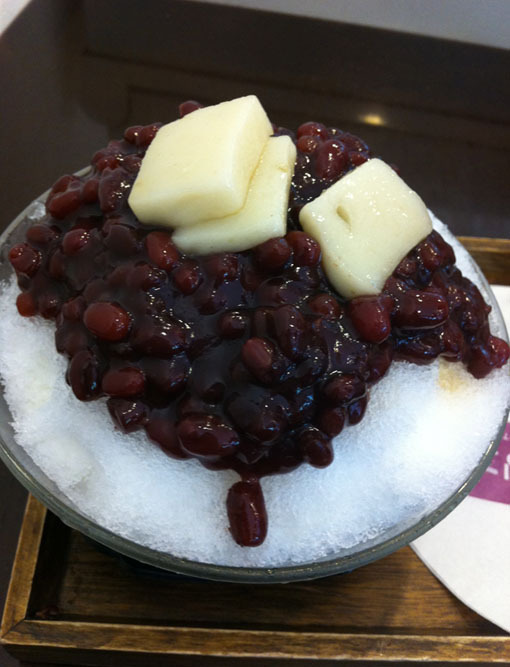 The simple taste of milk and finely shaved ice with mildly sweet red bean paste can never go wrong. Everything just melted in my mouth while cooling off my body. 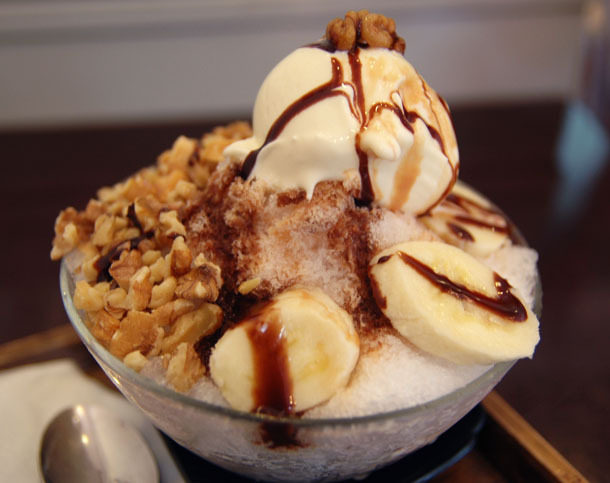 Bingsu has come a long way and now it comes in various flavors and a wide array of toppings. Many countries have their own versions of shaved ice. What are your favorite kinds? 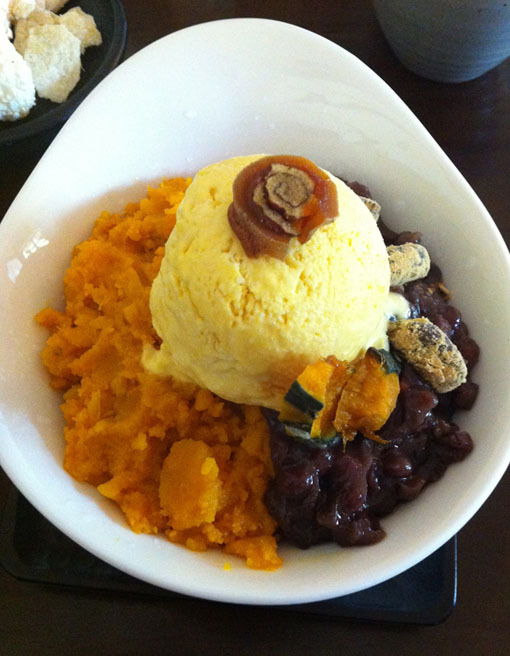 This entry was posted in Seoul, Taste and tagged bingsu, dessert, justine, Korea, Seoul, shaved ice.